“Sociology : Methodology, Methods, Mathematical Modeling” (Sociology: 4M) is a peer-reviewed scholarly journal presenting pioneering work on problems of methodology and methods of sociological research, on the collection, measurement and analysis of social science data, on building mathematical models of social processes. The journal was established by the Institute of Sociology RAS and the Central Economics and Mathematical Institute RAS in 1991. Sociology: 4M publishes articles that contribute to the development of sociological methodology, clarify the existing problems in this area and offer new solutions. In addition, it publishes analytical reviews of sociological methods. The research topics are not limited by this list; the decision on publication is made in each case individually. The journal is published twice a year. Full-text versions of articles are available for open access after a one year delay. All papers submitted to Sociology: 4M are screened by the editors for general suitability. The reasons for the negative decision may include the absence of mathematical models verification based on original empirical data, insufficient description of the empirical data sources, inconsistency with current state of research on the problem, and the lack of scientific novelty. If the decision is positive the article is sent to formal review. The results of this review are crucial to the acceptance or rejection of the manuscripts. All papers meeting basic editorial criteria are reviewed at least by one expert. If necessary, editors appoint a second reviewer for the paper. The review procedure of is anonymous for both authors and reviewers. The experts receive manuscripts without any indication of the name and affiliation of the authors. Editors do not reveal the reviewers’ names to authors and not discuss their qualification. Reviewers are selected from experts in the subject area. The editorial team will contact the authors by email with the results of peer-review within three months after submission; if the reviews have not been received by this date, a new target date is announced. The editorial team provides authors the right to respond to comments of the reviewers and to clarify their own position. The journal publishes only original research papers which have not been published before (except for electronic preprints and theses). By submitting a manuscript the author agrees not to publish it in whole or in part in any form without the editors’ permission. There are no publication fees in Sociology: 4M. The total length of the manuscript shall not exceed 40.000 characters (including spaces). Materials should be submitted via e-mail sociology.4m@gmail.com. Page margins: 2 cm on all sides. Formulas and symbols should be typed in Microsoft Equation. The author should also provide an abstract, 8-10 keywords, author’s name, affiliation and position, contact information. The cover letter accompanying the manuscript should contain a description of scientific novelty and a brief justification of why the article may be of interest to «Sociology: 4M» readers. In this letter the author must confirm that the article is based on an original study, has not been published anywhere before (except as a preprint or in conference abstracts) and is not under consideration in any other journal. The editorial policy requires compliance with the requirements of publication ethics by all parties involved in the preparation of the article (authors, reviewers and editors), that provides the confidential review of manuscripts, absence of plagiarism or misappropriation of the results. The editorial board expresses its readiness to publish error reports and information about violations of publication ethics by authors. Authors should provide the following information in English: authors’ names, titles, authors’ affiliation (names of organizations, e-mail of the author responsible for correspondence), abstract and keywords. We recommend using the English organizations’ names from such citation indexes as Web of Science and Scopus. We also recommend supplying an extended English abstract (up to 250 words). Authors should provide references to all sources mentioned in the text. The author must indicate sources of all citations, numbers, and other information. Authors are responsible for the accuracy of quotes as well as numbers and other information. References to unpublished works are not permitted. 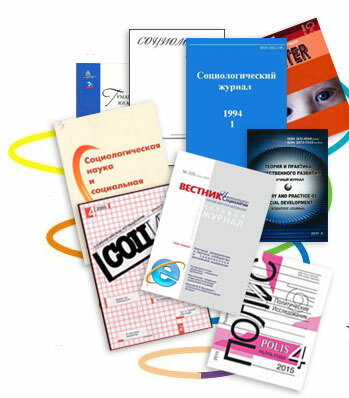 Bibliographic descriptions of publications should be made in accordance with Russian state technical standards (GOST). we recommend to provide the author names and source titles (jounals) in the form they are indexed in such citation databases as Web of Science and Scopus. source titles should be given in italics.